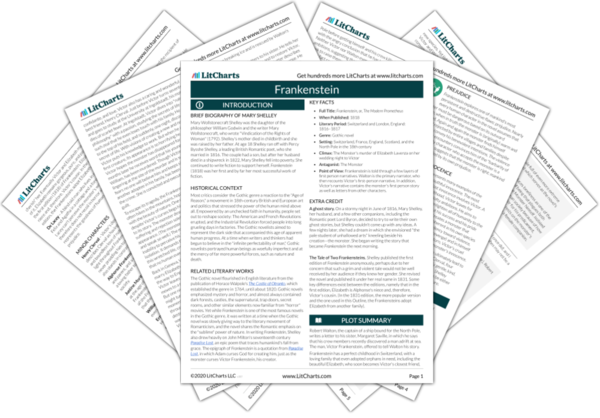 Instant downloads of all 946 LitChart PDFs (including Frankenstein). 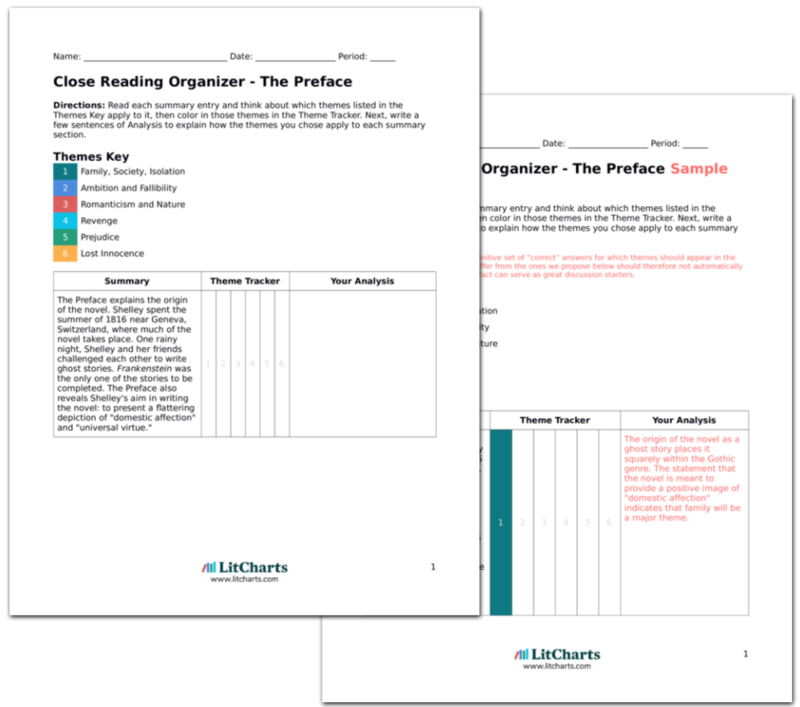 LitCharts assigns a color and icon to each theme in Frankenstein, which you can use to track the themes throughout the work. Victor wishes he could confess in Justine's place, but his absence at the time of the murder would make his confession sound like nonsense. Victor could confess everything, including his secret, but instead he chooses silence and isolation. At the trial, Justine maintains she is innocent, but cannot explain how William's portrait of his mother wound up in her pocket. She is sentenced to death. The monster must have framed Justine as part of his revenge on Victor. Victor speaks with a member of the court, who says that Justine has already confessed to the crime. Victor and Elizabeth visit Justine in prison, and she explains that she was pressured into confessing by her jailors. She succumbed, and confessed a lie. Justine says she's ready to die and leave behind the "sad and bitter world." Justine confesses to a crime she did not commit, she gives up her innocent honesty, to "save" her soul. She has given up her innocence, and now no longer sees the world as innocent either. The next day Justine is executed. Victor feels guilt overwhelm him for his secret role in William and Justine's deaths. Victor now understands the grave consequences of his ambition, but he continues to keep his secret. 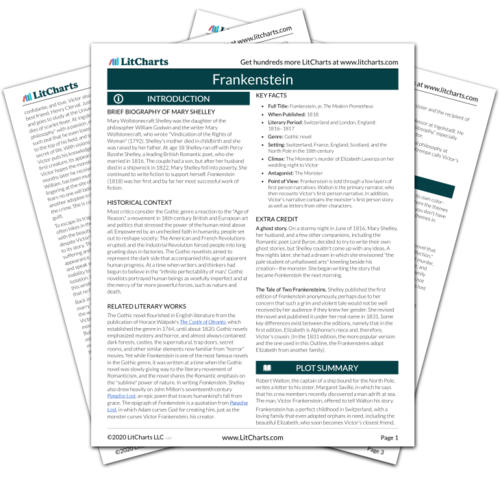 Get the entire Frankenstein LitChart as a printable PDF. Florman, Ben. "Frankenstein Chapter 8." LitCharts. LitCharts LLC, 22 Jul 2013. Web. 13 Nov 2018. Florman, Ben. "Frankenstein Chapter 8." LitCharts LLC, July 22, 2013. Retrieved November 13, 2018. https://www.litcharts.com/lit/frankenstein/chapter-8.